Step 1: Pour the oil into a large pot, it should be approximately 3 to 4 inches high, and heat to 325 degrees Fahrenheit. You can measure this using a thermometer. Step 2: In a large bowl, combine the cream cheese with the minced garlic, chives, Worcestershire sauce and lemon juice and mix until all the ingredients are well incorporated. Fold in the crab meat last, taking care not to break up the chunks of crab too much. Season with salt and pepper. Step 3: Arrange a wonton wrapper in the shape of a diamond. Place a small scoop of filling (about 2 teaspoons) in the middle of the wrapper. Moisten the tip of your index finger with water and outline the border of the wrapper. Fold the wrapper in half, to form a triangle, making sure to remove any pockets of air and seal the wonton. 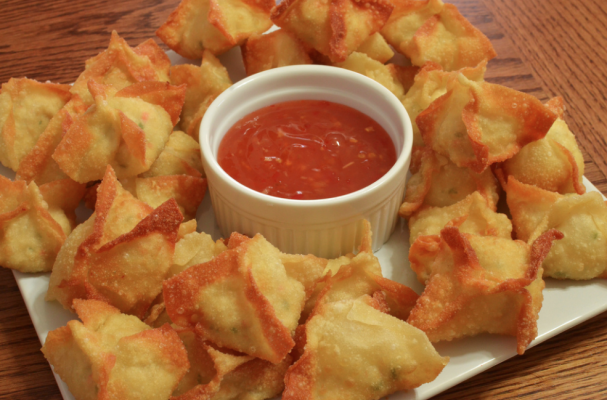 You can fry the wontons as a triangle but if want a prettier presentation, you can bring the two ends together and criss-cross them, using a little water to stick them together. This creates a wonton that looks like a little coin purse. Step 4: Drop the wontons in the oil, a few at a time. They should immediately sizzle and float to the top within a minute. Place on a paper towel to drain and serve hot with sweet and sour sauce or sweet chili sauce.